In the Washington County School District we have a cone site system where 4-5 elementary schools, an intermediate school (grades 6-7) and a middle school (grades 8-9) feed into a high school. The cone site is named for the high school. 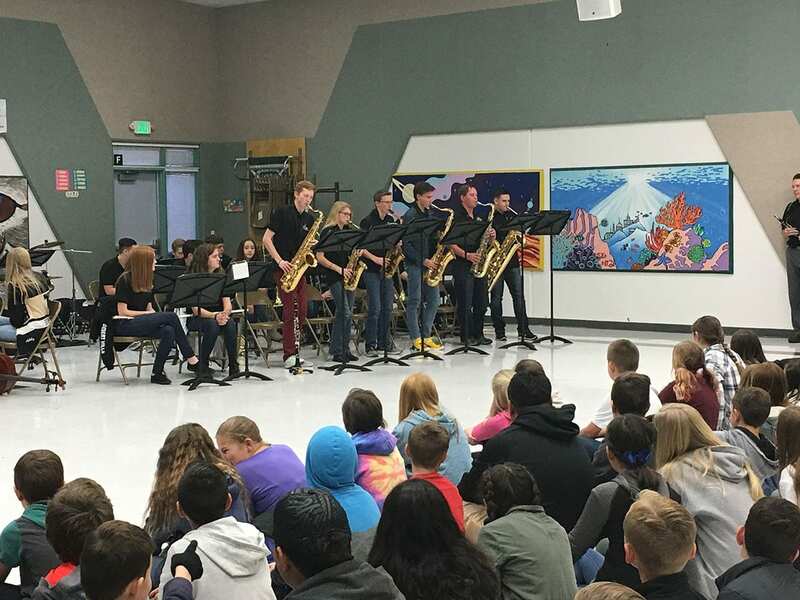 In our Desert Hills cone site we begin band instruction in 6th grade at the intermediate school. 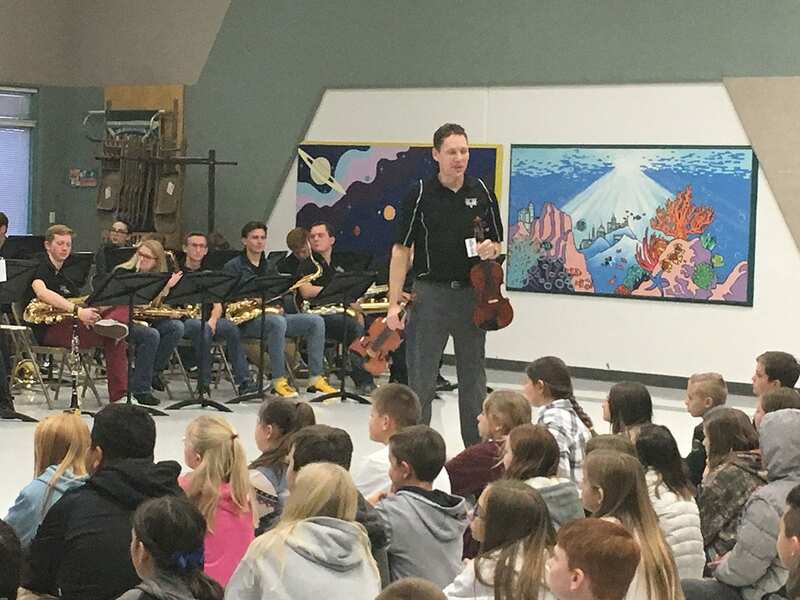 In this system our instrumental music teachers at all three secondary schools work very closely together to focus on recruiting new students into our program. We meet often and plan curriculum that aligns vertically that we know what students will be able to do when they get to each grade level and new school. We have created a true 6-12 music program and curriculum, not a school to school program. We work together as cone site teachers on our beginning recruitment program and begin with the end in mind. We want every student we see to choose band or orchestra and stick with out for the entire secondary school experience. We begin by scheduling a time for an assembly with the 5th graders at each elementary school that feeds into our cone site. This assembly takes place in January BEFORE 6th grade class registration happens. In this assembly we bring the high school jazz band and the high school orchestra. Also all of the band and orchestra teachers from all three schools attend and participate. 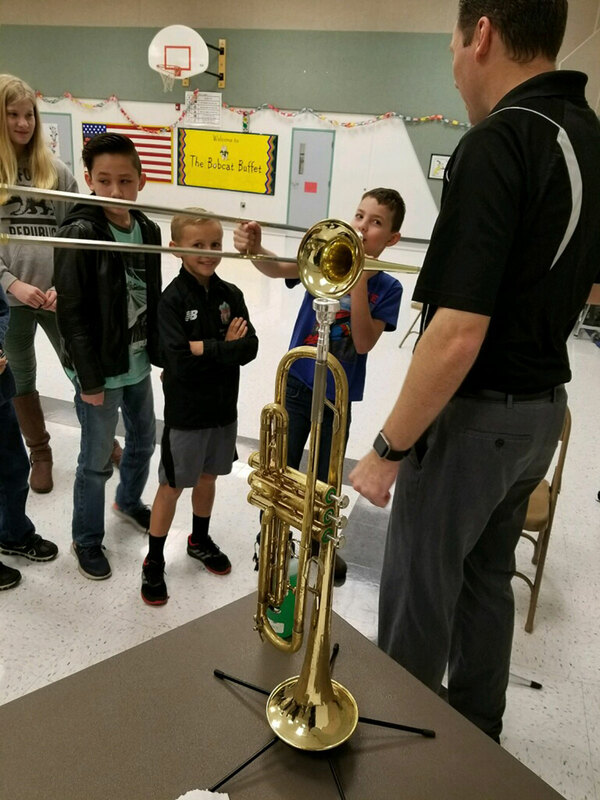 We introduce the instruments available with an engaging, fun program that includes the high school students performing on those instruments so the 5th graders can see and hear each one. Then each large group plays as well. Following the full grade assembly, we split the students up into their smaller classes and present an instrument petting zoo. 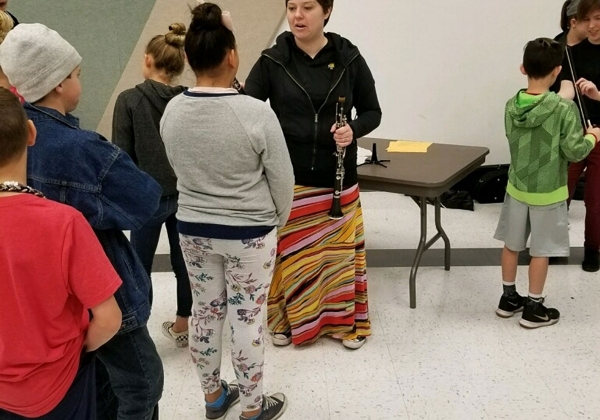 In this smaller setting the 5th graders meet the beginning band and orchestra teacher, are allowed to ask any questions about the instruments and are then given time to actually play the different instruments to get an idea of what they are like. We work with our community partner The Music Store which provides the instruments. 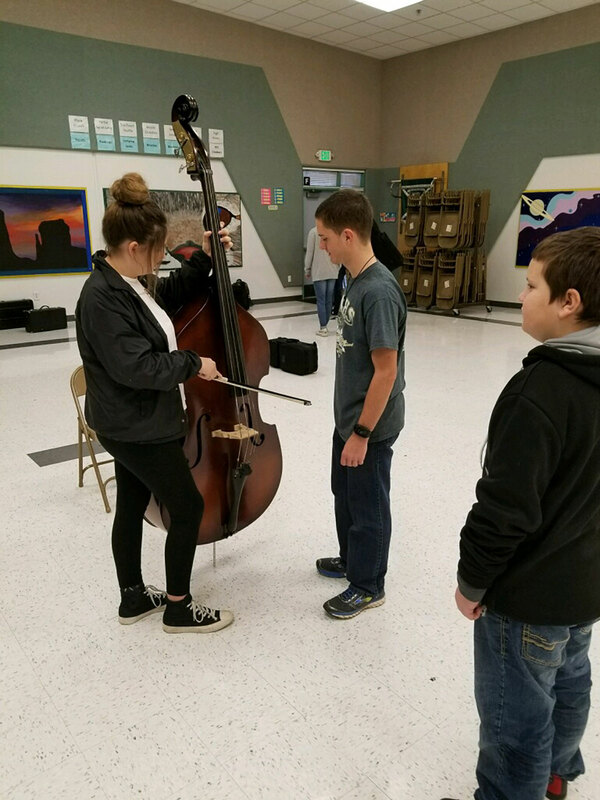 Each of the teachers and some high school students takes an instrument and focuses on every student successfully making a sound on the instrument. The teachers may guide and direct students to certain instruments where they might be more successful. Every 5th grade student gets the opportunity to hear, see, and play every instrument available in the beginning instrumental program. At the end of the petting zoo an informational booklet that contains reviews of each instrument available, possible rental costs, music participation expectations, and contact info for the beginning teachers. 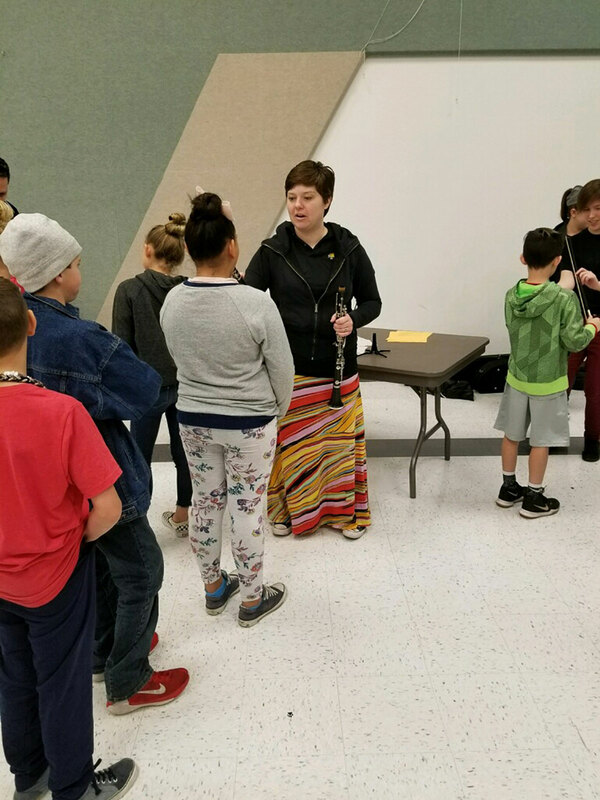 We then work with the 6th grade counselors by having them review in detail the information we covered at the assembly with the students during their class registration visits. 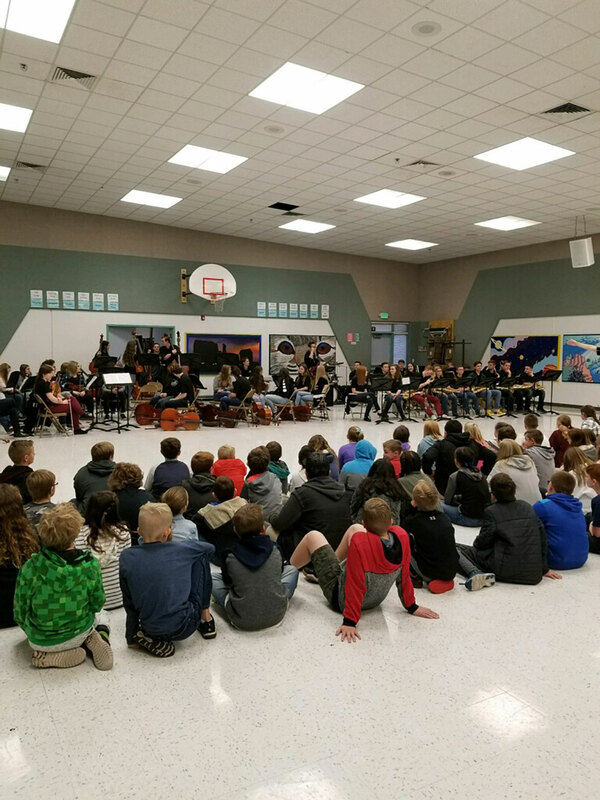 Lastly, as the 5th graders get a tour of the 6th grade building band and orchestra and included and discussed so the 5th graders can then see in context what the program will be like. All current 5th grade students within our 6 cone site elementary schools. There are 4 elementary schools where the entire 5th grade class attends our cone site, and two more schools where the split between cone sites. 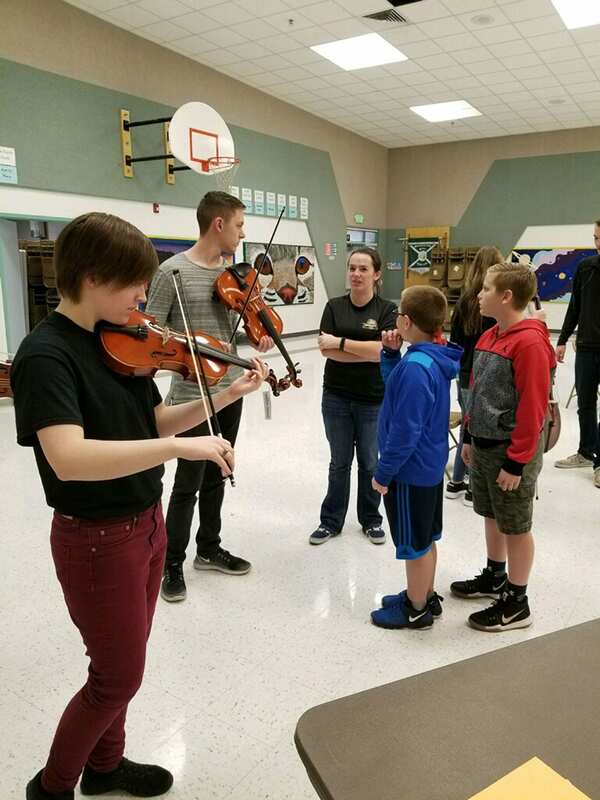 Currently we don’t need a budget – our high school covers the travel costs for the groups, and The Music Store donates their time and instruments for the petting zoos. We print the booklets at the school. We have been doing this recruiting project for 10 years now. It started the year our cone site schools opened. We have made small changes to the pacing of the program and updated the handout to current pricing information, but the core idea and presentation has not changed. We measure the success of this program in two ways – the number of students registering for 6th grade band and orchestra, and the retention of students through the high school program (because we begin with the end in mind). We have increased 6th grade registration in band and orchestra year over year for the entire 10 year program. We have the highest retention rate in the high school program as demonstrated by our course offerings – we are the only high school in the district that has two band classes (auditioned and non auditioned) and we are the only high school in the district to have two separate orchestra classes. The most important thing is the collaboration between schools and teachers. It has to be a joint effort with a joint vision and goal. The high school teacher has to be just as invested and supportive as the beginning teacher who will get the students initially. The second most important thing is the petting zoo – kids need to see and hear and hold the instruments first before they sign up for band or orchestra.